Since October 2008, UK is leading in offshore wind harvesting (currently generating around 3.6 GW), when it overtook Denmark, which was the first country to build an offshore wind farm 2.5km off the Danish coat at Vindeby. 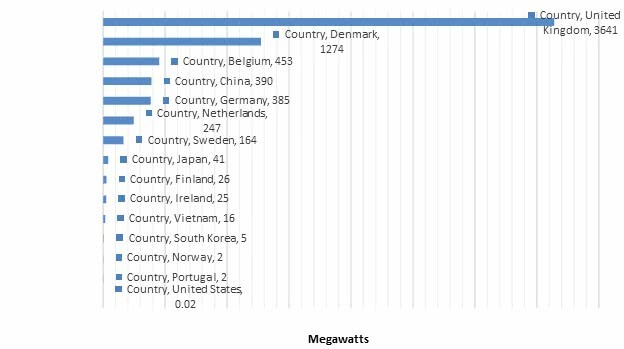 Figure 1 shows the cumulative offshore wind power capacity by country in 2013. On the other hand, Figure 2 shows the evolution of global offshore wind power capacity from 1993 until 2013. Indications show that construction of large scale offshore wind farms are on the rise – see for example South Korea, China and Japan. The growth is further enhanced possibly due to diminishing public confidence following the 2011 Fukushima Nuclear Power incident. A typical wind turbine contains around 8000 different components but the main components are rotor with the blades, nacelle, tower and the foundation. 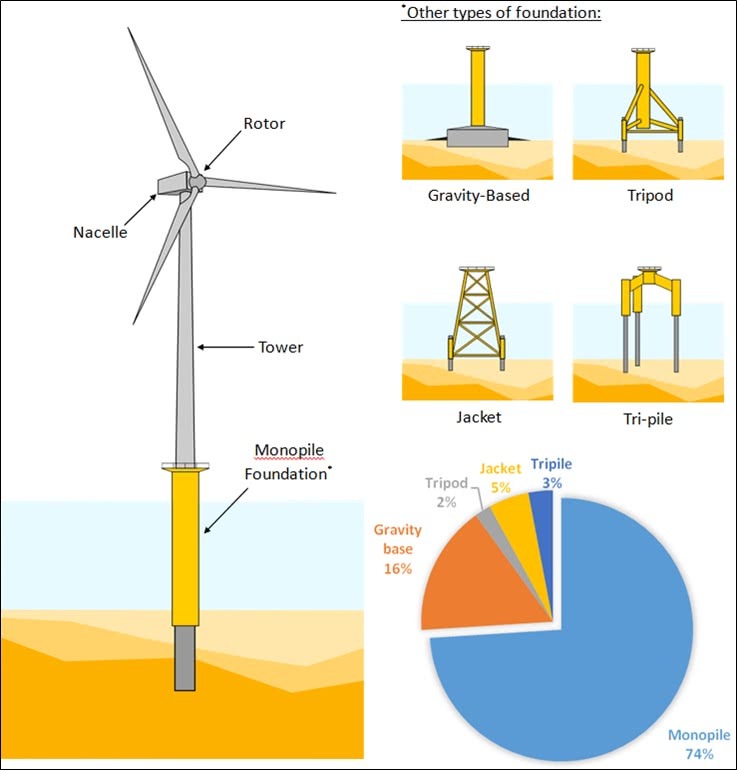 Figure 3 shows the main parts of a typical offshore wind turbine together with the common types of foundation. These structures are dynamically sensitive because a heavy rotating mass rest on a long slender column and the whole system is subject to wind and wave loading. In the current design (soft-stiff system), the natural frequency of these structures is in the order of 0.35Hz and is very close to the forcing frequency imposed by the 1P and 3P loading. Figure 4 shows the forcing frequencies plotted against the power spectral densities for a 3 bladed wind turbine. 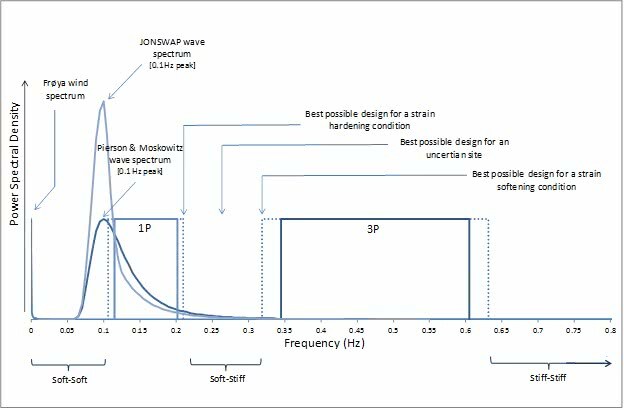 Due to the close proximity of the natural frequency of the system to the forcing frequency, the structure is expected to consistently vibrate and thus fatigue considerations are one of the important design considerations. Further details of the characteristics of the loading can be found in Bhattacharya et al (2013a, 2013b) and Lombardi et al (2013). These papers and many more can be downloaded freely from. 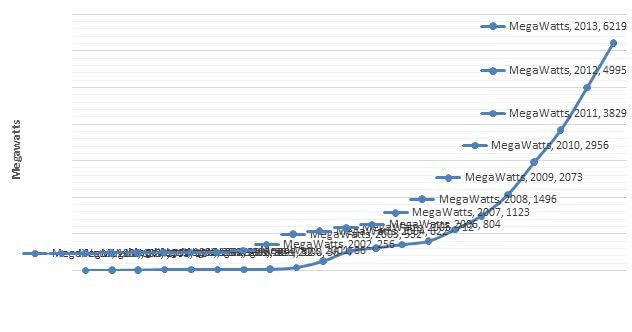 Figure 4 Forcing frequencies plotted against the power spectral densities for a 3 bladed NREL standard 5 MW wind turbine. 3P stands for blade passing frequency (Bhattacharya et al, 2013). The wind turbines are currently designed to have a life of 25 to 30 years, but there is no track record of long term performance. The dynamic behaviours of these systems are not fully known. However limited field records suggest the modal properties of the system (natural frequency and damping) of the wind turbine system are changing and there are speculations that these structures may tilt. The plausible explanations for the observed phenomenon are the effects of dynamic soil-structure interaction whereby cyclic/dynamic loads on the soil surrounding of the foundation alter its stiffness. It must be noted that the entire structure is supported on the foundation which derives its stiffness from the soil surrounding it and any change in soil properties will alter the dynamics of the overall system. Therefore to predict the long term performance, in depth study on dynamic soil-structure interaction and damping is required. Damping has a great impact on the fatigue damage, which depends on the amplitude of vibrations induced by the loadings mentioned before. The overall damping of the first bending mode of an offshore wind turbine will be a combination of soil damping, aerodynamic damping, material damping, damping from wave creation due to structure vibration, viscous damping due to hydrodynamic drag, and damping due to vortex shedding. The soil damping compared to all the other damping contributions is considered to be the complex having the highest share in the overall damping contribution. It mainly depends on the material hysteresis and therefore on the type of soil material the wind turbine is placed on. (A) A series of scaled model tests whereby the overall physics/ mechanics of the problem are being explored mainly the dynamic soil structure interaction. Figure 5 shows various scaled models of the setup whereby 10 different types of foundations were studied. The various limitations of scaled model tests were taken into account while analysing the results. The tests are being conducted in standard laboratory sand (silica sand: RedHill and Leighton Buzzard) and Kaolin clay. The main objectives of these experiments are: (i) to identify the dynamic characteristics of the system (modes of vibration), with emphasis on the natural frequency and the overall damping component. Specifically it was observed that monopole types of foundation exhibit single peak response due to sway-bending mode of vibrations and on the other hand multiple pod shallow foundations exhibit two peak response due to rocking mode of vibration in two orthogonal plane along their principle axis; (ii) to examine the effects of the cyclic loading in terms of frequency and damping change with number of cycles. (B) In order to scale up the experimental results to predict the prototype consequences, it is necessary to link the experimental results to element tests of the soil. 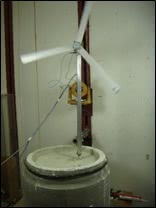 It is unlikely that a real wind turbine will be supported in soils having properties similar to that of the experiments and this is where element tests of soils become important. Non-dimensional groups are developed from scaled model tests which are linked through element tests for prototype prediction. For example cyclic loading can be applied to a small element of soil to study the changes in behaviour which can then be linked to prototype prediction. The experimental results and soil element tests are being conducted at the Geomechanics Laboratory, University of Surrey. 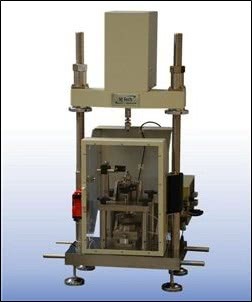 Figure 6 presents the apparatus that will be used to conduct the soil element testing. The next phase of this research will be to compare and verify the results from the experimental modelling with the results from numerical modelling. 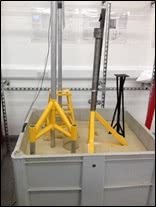 Figure 6: VJ Tech Dynamic simple shear apparatus used at the Geomechanics Laboratory, University of Surrey. However the real damping of an offshore wind turbine is really difficult to predict by computational techniques. 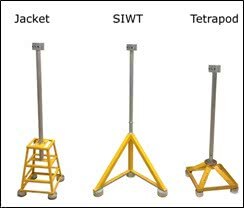 Therefore measurements from an existing offshore wind turbine are important in order to verify the outcome of both experimental and numerical modelling. For this reason a special sensors are also being researched and developed that can be deployed on real wind turbines in order to collect data and health monitoring.